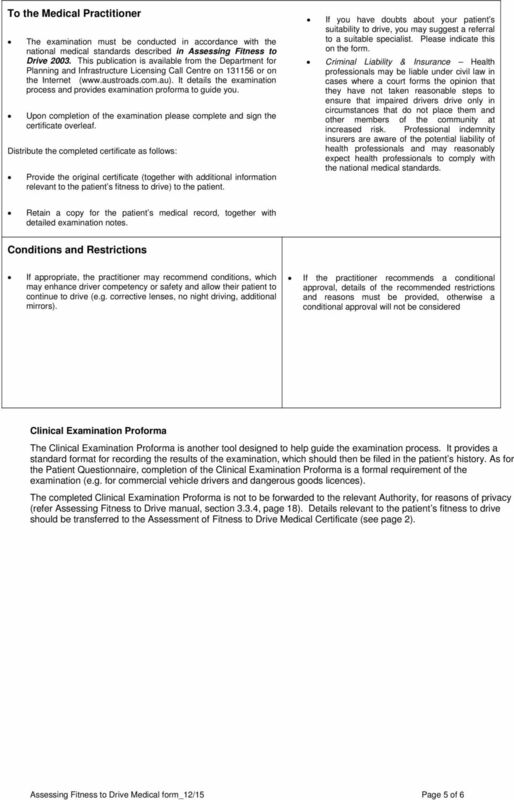 Download "Assessment of Fitness to Drive to be completed by medical practitioner"
4 ASSESSING FITNESS TO DRIVE PATIENT QUESTIONNAIRE Name: Address: Please answer the questions by ticking the correct box. If you are not sure, leave question blank and ask your doctor what it means. The doctor will ask you additional questions during the examination. No Yes 1. Are you currently being treated by a doctor for any illness or injury oo oo 2. Are you receiving any medical treatment or taking any medication (either prescribed or otherwise) oo oo (Please take any medications with you to show the doctor) 3. Have you ever had, or been told by a doctor that you had any of following? 3.1 High blood pressure oo oo 3.2 Heart disease oo oo 3.3 Chest pain, angina oo oo 3.4 Any condition requiring heart surgery oo oo 3.5 Palpitations/irregular heartbeat oo oo 3.6 Abnormal shortness of breath oo oo 3.7 Head injury, spinal injury oo oo 3.8 Seizures, fits, convulsions, epilepsy oo oo 3.9 Blackouts, fainting oo oo 3.10 Stroke oo oo 3.11 Dizziness, vertigo, problems with balance oo oo 3.12 Double vision, difficulty seeing oo oo 3.13 Colour blindness oo oo 3.14 Kidney disease oo oo 3.15 Diabetes oo oo 3.16 Neck, back or limb disorders oo oo 3.17 Hearing loss or deafness or had an ear operation or use a hearing aid oo oo 3.18 Do you have difficulty hearing people on the telephone (including use of hearing aid if worn)? oo oo 3.19 Have you ever had, or been told by a doctor that you had a psychiatric illness, or nervous disorder oo oo 3.20 Have you ever had any other serious injury, illness, operation, or been in hospital for any reason? oo oo 4.1 Have you ever had, or been told by a doctor that you had a sleep disorder, sleep apnoea, or narcolepsy? oo oo 4.2 Has anyone noticed that your breathing stops or is disrupted by episodes of choking during your sleep? oo oo 4.3 How likely are you to doze off or fall asleep in the following situations, in contrast to feeling just tired? This refers to your usual way of life in recent times. Even if you haven t done some of these things recently try to work out how they would have affected you. Use the following scale to choose the most appropriate number for each situation: 0 = would never doze off 2 = moderate chance of dozing 1 = slight chance of dozing 3 = high chance of dozing It is important that you put a number (0 to 3) in each of the 8 boxes. Situation Chance of dozing (0-3) Sitting and reading Watching TV Sitting, inactive in a public place (e.g. a theatre or meeting) As a passenger in a car for an hour without a break Lying down to rest in the afternoon when circumstances permit Sitting and talking to someone Sitting quietly after a lunch without alcohol In a car, Commercial while stopped Vehicle for a few Driver minutes Medical in the Assessment traffic formpage 4 of 6 5. Please circle the answer that is correct for you: 5.1 How often do you have a drink containing alcohol? Never Monthly Two or four Two to three Four or more or less times a month times a week times a week 5.2 How many drinks containing alcohol do you have on a typical day when you are drinking? 1 or 2 3 to 5 5 to 6 7 to 9 10 or more 5.3 How often do you have six or more drinks on one occasion? 5.4 How often during the last year have you found that you were not able to stop drinking once you had started? 5.5 How often during the last year have you failed to do what was normally expected from you because of drinking? Monthly 5.6 How often during the last year have you needed a first drink in the morning to get yourself going after a heavy drinking session? Monthly 5.7 How often during the last year have you had a feeling a guilt or remorse after drinking? 5.8 How often during the last year have you been unable to remember what happened the night before because you had been drinking? 5.9 Have you or someone else been injured as a result of your drinking? No Yes, but not in Yes, during the the last year last year 5.10 Has a relative or friend, or a doctor or other health worker been concerned about your drinking or suggested you cut down? No Yes, but not in Yes, during the the last year last year (Scoring of the AUDIT questionnaire is shown in the section on Alcohol page 31). No Yes 6. Do you use illicit drugs? oo oo 7. Do you use any drugs or medications not prescribed for you by a doctor? oo oo 8. 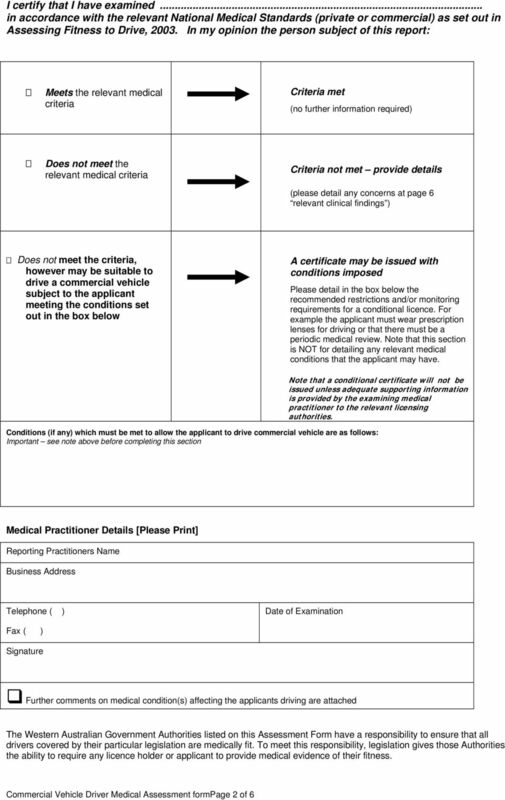 Have you been in a vehicle crash since your last licence examination? oo oo If Yes, please give details: Applicant s Declaration (in presence of doctor): I, certify that to the best of my knowledge the above information supplied by me is true and correct Signature: Date: / / IMPORTANT For privacy reasons, the completed Patient Questionnaire must not be returned to department. 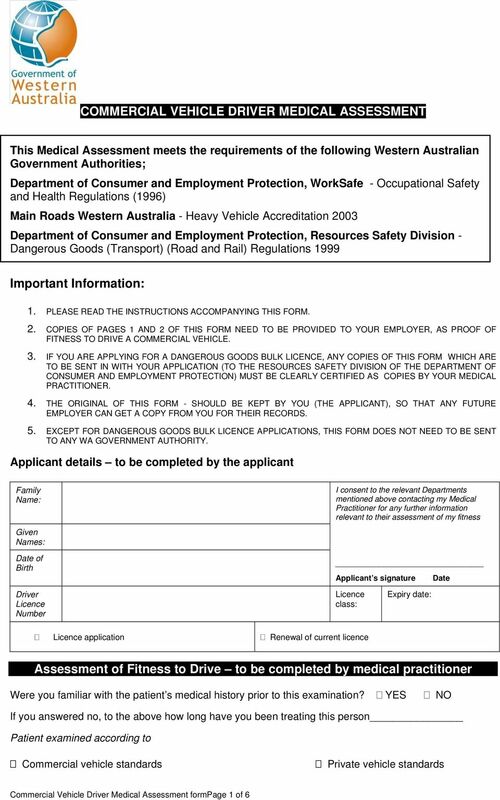 Medical information relevant to driver licensing should be included on the Medical Certificate. Page 1 of 8. 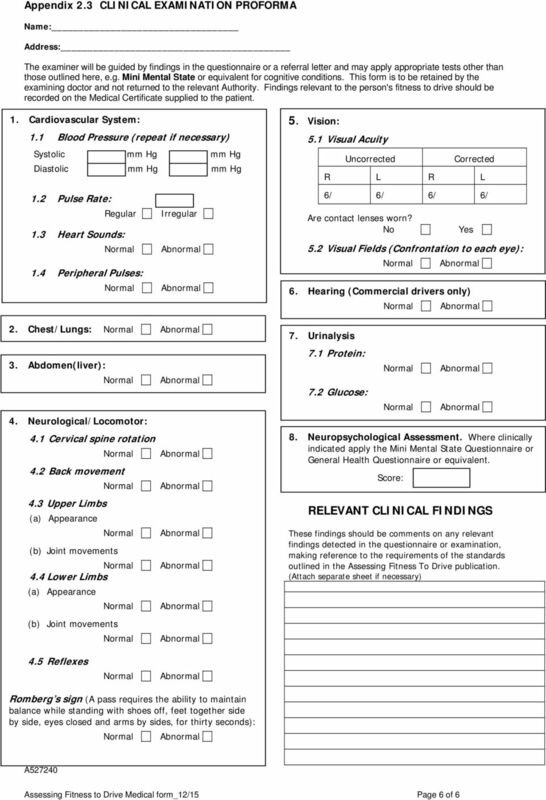 SLEEP DISORDERS CENTER QUESTIONNAIRE Swedish Medical Center. Name: Date: Height: Weight: Neck Size: Handedness: Right/Left. TEXAS ASSOCIATION OF PEDIATRIC NEUROLOGY, P.A. Jerry J. Tomasovic, M.D. 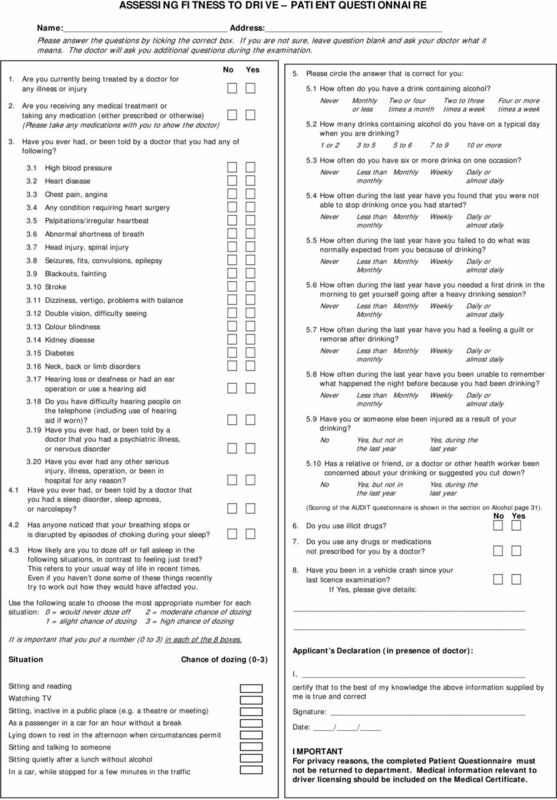 Medical Massage Client Intake Form Medical Massage Client Intake Form Client Name: Date: Please note: The more information you are able to provide, the better equipped our therapists will be to help you. 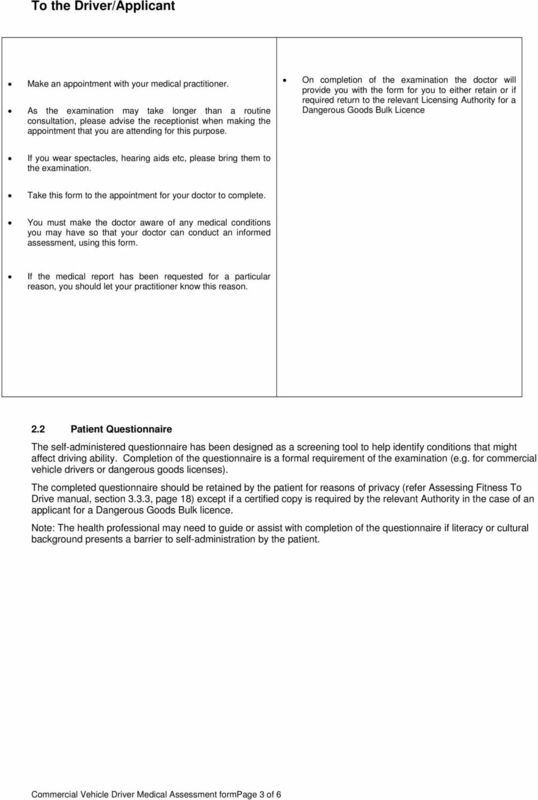 PRE-OPERATIVE ASSESSMENT HEALTH QUESTIONNAIRE. Welcome to the pre operative assessment clinic. INTRAVENOUS SEDATION WHAT IS INTRAVENOUS SEDATION? Intravenous sedation in dentistry is a modern, safe and effective technique of sedation that will make your dental visit a relaxing and comfortable experience.